July 21, 2018 – It was recently reported that Kanonen, an Intamin hydraulic launch coaster recently removed from the Swedish amusement park Liseberg, was acquired by Lost Island Waterpark of Waterloo, Iowa. The news were broken by First Drop, the news magazine of the European Coaster Club. However, neither park has yet made any press release about the acquisition. Replying to an enthusiast Instagram post that reported these news, Lost Island’s marketing department confirmed the purchase, but also stated they had no intention of re-erecting the coaster. Instead, Kanonen might be put up for sale again next year. 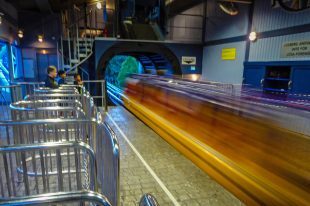 Kanonen is one of the smallest hydraulic launch coasters ever built by Intamin. It debuted at Liseberg in 2005 and featured two inversions over its 1443 feet (440 m) of track. Riders were catapulted to a speed of 47 mph (75 km/h) and a height of 79 feet (24 m). News has been sparse about the coaster since it was removed from Liseberg at the end of the 2016 season. Its plot is currently being filled by Valkyria, a Bolliger & Mabillard Dive Coaster due to open later this year. As Kanonen only served for 12 seasons before it was carefully dismantled, it should have many good years of operation left when it eventually finds a new home. Lost Island Waterpark does not operate any coasters, or for that matter any mechanical attractions apart from its water slides and a go-kart track. Its decision to purchase a second-hand launch coaster has left many coaster enthusiasts puzzled. With no official statements to go by, the story and eventual fate of Kanonen is surrounded by mystery. For a while, Kanonen was rumored to be headed for Dorney Park of Allentown, Pennsylvania, but the rumors have now been proven to be unsubstantiated. Read more about those rumors and discuss Kanonen’s eventual fate in our discussion forums. This entry was posted in News and tagged Iowa, Kanonen, Liseberg, Lost Island Waterpark, purchase, resale, Sweden. Bookmark the permalink.